Cherry-picking | Wott's Up With That? “My Blog Spawn”. Thanks, I guess, to What’s Up With Watts for pointing out how Anthony Watts privately obsesses over his critics, in all the completely irrelevant ways possible. What a painful example of projection, resentment, back-of-the-classroom goonery, and (hard for him to fight the compulsion) cherry-picking. If he doesn’t stop Googling he may go blind! Reason for creating the blog: he got kicked off WUWT for multiple policy violations, got mad, still trying to get even. Anthony wants you to know that I frivolously run marathons, but not that I’m a geologist. His way of deflecting my exposure of his bankrupt arguments is troll flickr for photos of me that he thinks are embarrassing, not to point out any actual errors on my part (hey Tony, here’s a tip; I have funnier ones on Facebook). Naturally my motivation, according to him, is revenge over unspecified “multiple policy violations” in my comments on his blog. Not his endless lying and remorseless Nixonian suppression of opponents. Hats off to fellow “skewered” garbage collectors, currently vvattsupwiththat.com, wottsupwiththatblog.wordpress.com, whatsupwiththatwatts.blogspot.com and hotwhopper.com. These days you have a stronger stomach that I! “Analysing the complete hadCRUT yields some surprising results” (2011-08-04). 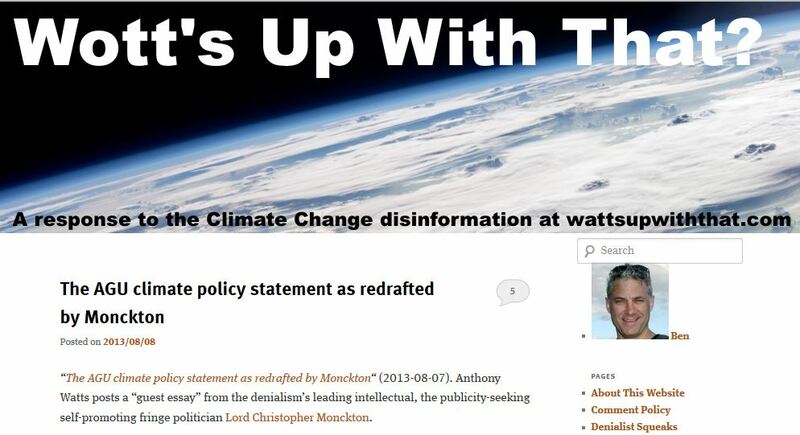 Anthony Watts learns from a post by right-wing “Global Warming Policy Foundation” lobbyists about a post by Luboš Motl that proves that 30% of the Earth has cooled. Run from the Ice Age! Or something like that. After five years of denialist pretense that the data was being hidden from them (because they had to go to the trouble of requesting it from the various national meteorological organizations that owned it) the unified release of the global data set used by the Climate Research Unit at the University of East Anglia has forced them to switch to a new fake numbers game. Expect a lot more of this kind of transparent misdirection, designed to keep the uninformed public distracted. Expect Anthony to make a big fuss about it each time. Look at how much of that cRaZy blue there is! Err, maybe this is why scientists use statistics? To collect and objectively interpret large data sets with complex trends and arrive at an objective understanding. Hold on. Is Motl really trying to make the point that unless every station shows a warming trend then we can’t claim that there is global warming? Is his point really so dogmatically stupid? Maybe, because in spite of his self-declared brilliance Motl has to admit that he got “standard deviation” mixed up with “root mean square“. Unfortunately he says “I don’t have the energy to redo all these calculations – it’s very time-consuming and CPU-time-consuming” but I’m sure it’s a wash, huh? Anthony Watts and the “Global Warming Policy Foundation” are certainly happy to overlook this, because to them the fact that 30% of the recording stations show a cooling history apparently makes their heads reel. Not climate scientists however. Only an idiot would expect a trend to be uniformly expressed throughout a complex natural system. Oh, that’s right. We’re talking about Anthony Watts, aren’t we? Climate change is not a uniform and linear global transition. This is a very small cherry-picked region of the Earth that happens to match Anthony’s agenda. Increased evaporation over oceans due to the warmer temperatures results in increased precipitation over land. In a warmer world it’s less frequently too cold to snow (look up relative humidity). 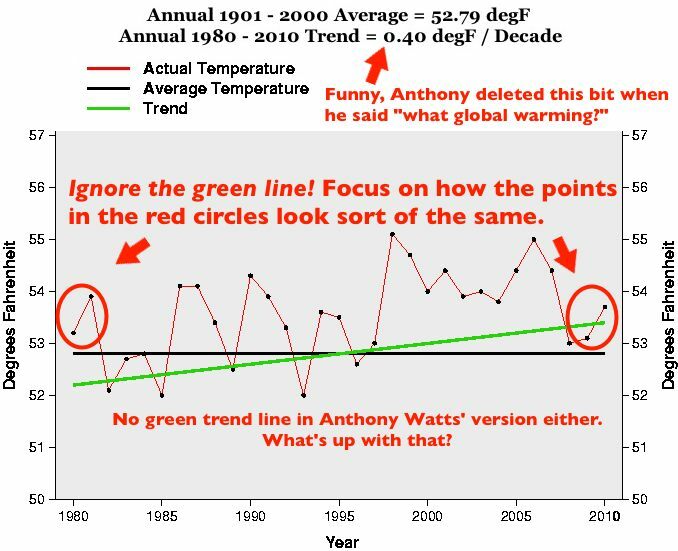 Anthony is quoting newspaper articles of “alarmist” warnings about declining snowpack, not the published science. Bet you can add a few more yourself. Funny how taking a step back is always so fatal to Anthony's arguments.